I was commissioned by my client to design this cake for her colleague's birthday. He is an anesthesiologist but she didn't want any doctor themed cakes. She described him as a quiet and serious person who loves to listen to Jazz music. 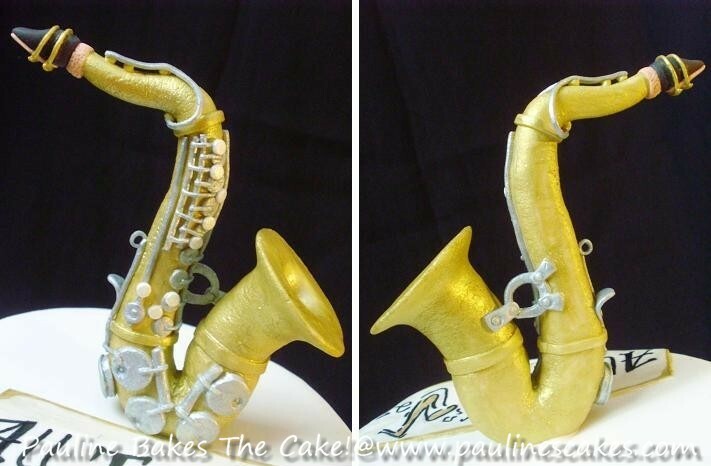 We then decided upon a Jazz music themed cake with a sugar art saxophone for this Jazz music lover. ... in black and gold! ... in gold and silver! I think the saxaphone on this cake is fabulous! I'm baking a cake tomorrow for my future father in laws 60th birthday and I hope it turns out well. He's a jazz lover and I needed a saxaphone to immitate. If it turns out well I'll post a picture, if not you already know what happened, lol. But once again, I think you did a marvelous job on the details! I'm loving the "All That Jazz" cake....I'd love to have something like that for my son. Being from New Orleans and all and he plays the piano and sax this would be a great surprise for him. He's not a kid that asks for much but he'll make 16 next year and this gives me an idea of what to do already. I'd have to have N.O. or 504 somewhere on there or even the Saints emblem. Did you use anything to make the instrument stand up? 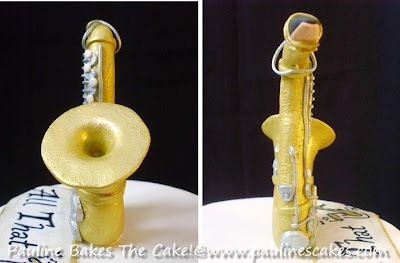 How did you get the sax to stand up right. Did you use a wire or is it all foundant? How did you get the sax to stand up? I am trying to do one but not succeeding.